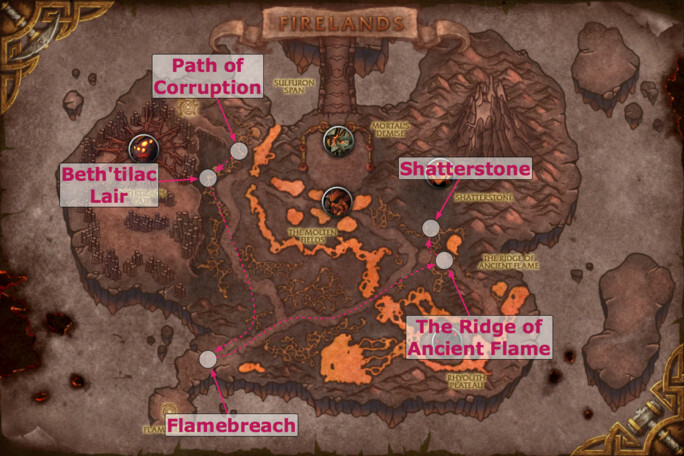 This guide is intended to provide a comprehensive description of the encounter with Shannox in Firelands. It is targeted at anyone who desires to understand the fight mechanics. Shannox is one of the first five bosses of the Firelands raid instance, which can be attempted in any order. The encounter will test your raid's ability to properly balance DPS, handle bursts of damage and move out of harmful ground effects. Proper understanding of the mechanics of the encounter, however, will make this fight much easier for your raid. in 25-man heroic difficulty: 96.9M health. Shannox is accompanied by his two dogs, Rageface and Riplimb. On normal mode, Rageface and Riplimb have 8.2M health each in 10-man difficulty and 28M health each in 25-man difficulty. On heroic mode, Riplimb has 4.1M health in 10-man difficulty and 14.3M health in 25-man difficulty, while Rageface has 36.4M health in 10-man difficulty and 127M health in 25-man difficulty. Shannox has a 10 minute enrage timer. This is only relevant to heroic mode, however, as the final phase in normal mode has a soft enrage mechanic which will most likely wipe your raid before the hard enrage. in 25-man heroic difficulty: 2 tanks, 6-7 healers and 16-17 DPS. Shannox is essentially a single phase encounter during which you will not only face Shannox himself, a Flamewaker with the traits of a hunter, but also his two pets, Riplimb and Rageface. The abilities of his pets and their synergy with Shannox will shape the strategy you should employ. Shannox will become enraged and do additional damage and attack faster whenever Riplimb and Rageface are killed, and Riplimb and Rageface will become enraged when Shannox reaches 30% health. Because of the specifics of their enrage mechanics (detailed below) you will want to kill Rageface and Riplimb first, and survive Shannox's enrage. A melee attack, which hits for about 22,000 damage in 10-man difficulty and 46,000 damage in 25-man difficulty, and occurs roughly every 2 seconds. Immolation Trap: Shannox will regularly fire off Immolation Traps around himself. 2 seconds after being fired, a trap will become armed and it will detonate on contact with either a raid member or Rageface or Riplimb. On detonation, the trap will deal 65,000 Fire damage followed by another 50,000 Fire damage over 3 seconds, and it will increase its target's damage taken by 40% for 9 seconds. The trap is not AoE and will only affect the player or dog who has triggered its detonation. Crystal Prison Trap: Shannox will regularly fire off Crystal Prison Traps around himself. 2 seconds after being fired, a trap will become armed and it will detonate on contact with either a raid member or Rageface or Riplimb. On detonation, the trap will encase its target in a Crystal Prison. The block can be damaged and destroyed, which will free its target. The Crystal Prison has 600,000 health in 10-man difficulty and 950,000 health in 25-man difficulty. When Rageface and Riplimb become trapped in a Crystal Prison, the prison will damage itself entirely over 10 seconds. Arcing Slash: every 10-15 seconds, Shannox performs a cleaving attack with his spear in a wide conic area in front of him. In addition to the cleave damage, Shannox also applies Jagged Tear on his main aggro target. Jagged Tear: places a bleed on the main aggro target whenever Shannox peforms an Arcing Slash. The bleed ticks for 2,500 Physical damage every 3 seconds for 30 seconds, and stacks if the same player is targeted multiple times, thus requiring a tank swap. Hurl Spear: Shannox throws his spear at a target location, indicated by a red circle on the ground. The spear deals a high amount of Physical damage to enemies within 3 yards of the location and 50,000 Fire damage to everyone within 50 yards. It then causes the ground around it to erupt in fiery explosions in a spiraling pattern clearly indicated by small fire marks. Both the initial location as well as the explosions should be avoided. Shannox's spear is then returned to him by Riplimb. While he misses his spear, Shannox cannot perform Arcing Slash. Magma Rapture: after Riplimb is killed, Shannox performs an ability similar to Hurl Spear. He no longer throws his spear at a target location, but instead he drives it into the ground, inflicting 42,500 Fire damage and increasing fire damage taken by all players by 40% for 1 minute. The fire damage increase stacks. Magma Rapture causes the same kind of fiery explosions as Hurl Spear. Shannox casts this every 15 seconds. Frenzy: Shannox becomes enraged when Riplimb and Rageface are killed, gaining 30% increased damage and attack speed for each of his pets. Separation Anxiety: whenever Shannox is more than 60 yards away from either of his two pets, both himself and the respective pet will gain a 100% attack damage and attack speed increase. A melee attack, which hits for about 15,000 damage in 10-man difficulty and 25,000 damage in 25-man difficulty, and occurs roughly every 2 seconds. Limb Rip: every 8-10 seconds, Riplimb deals a moderate amount of damage to his main aggro target, and more importantly, applies Jagged Tear (same as Shannox's) to them as well. Remember that Jagged Tear stacks. Frenzied Devotion: if Riplimb is alive to witness Shannox reaching 30% health, he goes into a frenzy, increasing damage done by 400% and attack speed by 200%. Wary: after Riplimb is affected by one of Shannox' traps, he gains this buff. For the next 25 seconds, it grants Riplimb immunity against all traps. Separation Anxiety: whenever Riplimb is more than 60 yards away from Shannox, both Riplimb and Shannox will gain a 100% attack damage and attack speed increase. A melee attack, which hits for about 18,000 damage in both 10 and 25-man difficulty, and occurs roughly every 2 seconds. Face Rage: makes Rageface focus on a target, stun them and deal 7,000 Physical damage to them every 0.5 seconds, which increases over time. Rageface will continue this until he is damaged for at least 30,000 damage (in 10-man difficulty) or 45,000 damage (in 25-man difficulty) in a single hit. This is made considerably easier by the fact that, while Face Raging, all attacks made against Rageface will be critical hits. Wary: after Rageface is affected by one of Shannox' traps, he gains this buff. For the next 25 seconds, it grants Riplimb immunity against all traps. Separation Anxiety: whenever Rageface is more than 60 yards away from Shannox, both Rageface and Shannox will gain a 100% attack damage and attack speed increase. The strategy for the Shannox encounter is fairly simple. Your execution of the fight is based on your goal: bring Shannox close to 30% health, kill Rageface and Riplimb and then nuke down Shannox. To achieve that goal, tanks, healers, and DPS will have to perform a variety of tasks, which we detail in the next sections. A worthy mention is that Rogues can disarm both of Shannox' traps. While this is not an efficient tactic to employ for the entire duration of the fight, it can prove very useful in getting rid of traps which are dangerously close to the boss and which may affect melee players or tanks. Your raid will have to deal with Jagged Tear (caused both by Shannox' Arcing Slash and Riplimb's Limb Rip) through one of two ways. Keeping in mind that both Shannox and Riplimb are immune to taunt, we propose the following two approaches. Your raid can choose to have Shannox and Riplimb tanked by the same tank. Once this tank has too many Jagged Tear stacks, the off-tank should gain aggro of both Shannox and Riplimb, and continue tanking them until the main tank's Jagged Tear stacks drop off. This will require that your tanks over-aggro one another "manually" (without the use of taunts). Abilities such as Hand of Salvation and Intervene can be of use here. Alternatively, your raid can have one tank on Shannox and one tank on Riplimb. Obviously, in this situation, Jagged Tear will continue to stack on both tanks indefinitely. To counter this problem, your raid should attempt to delay Riplimb's return to Shannox after a Hurl Spear as much as possible to allow the stacks to drop on both tanks. While Riplimb is returning the spear, he does not cast Limb Rip, and therefore does not apply Jagged Tear on his tank. The same applies to Shannox who, without his spear, cannot cast Arcing Slash, the attack that applies Jagged Tear on his tank. Riplimb appears to be susceptible to some slowing effects, which should be used. Additionally, your Riplimb tank should position himself in such a way that, when running towards the spear, or back to Shannox with the spear, Riplimb will trigger a Crystal Prison Trap. This is not always possible, due to the Wary buff, which might be triggered by accidentally having Riplimb step on a trap, but should be attempted nonetheless. Abilities, such as Heroic Leap or Leap of Faith, can be used to further delay the next application of Jagged Tear on a tank (by keeping them away from Riplimb or Shannox for a little bit longer). Tanks will have to keep Separation Anxiety in mind when positioning themselves, as forcing a distance greater than 60 yards between Shannox and Riplimb will cause both of them to become enraged and most likely wipe your raid. In either case, the damage from Jagged Tear is rather lenient, and healing should only start posing problems when tanks reach around 10 stacks. Additionally, Shannox should be faced away from the raid so that no one else is damaged by Arcing Slash (this includes the off-tank). All raid members should avoid both Immolation Traps and Crystal Prison Traps. If any member becomes entraped in a Crystal Prison, they should quickly be freed (by destroying the prison). In addition to this, whenever Hurl Spear occurs, everyone should be careful not to be in range of the target location or subsequent explosions. Rageface cannot be tanked, and his targets should simply be healed. Whenever Rageface targets a raid member, he should be attacked so that he abandons his target. Classes with particularly hard hitting abilities, such as Marksmanship Hunters or Arcane Mages are preferable for this, as a single hit of at least 45,000 damage must be dealt. As Rageface and Riplimb are both susceptible to Immolation and Crystal Prison Traps, you should try to engineer ways for them to be affected by traps as much as possible. Crystal Prison traps will give your healers a respite as it takes the pets around 10 seconds to escape the trap, while Immolation Traps will provide a substantial DPS increase. In addition to this, having traps triggered by either pet will cause the trap to disappear and will reduce the chance of your raiders triggering them instead. If your raid chooses to tank Shannox and Riplimb together, cleaving effects such as Blade Flurry should be used to damage both targets. If you are tanking them apart, then simply assign 2 DPS in 10-man and 5-6 on Shannox, and a similar number on Riplimb. One hard hitting ranged DPS in 10-man difficulty and 3-6 in 25-man difficulty should be assigned to DPS Rageface at all times. This will not only ensure even DPS on all targets, but also that his Face Rage will be interrupted very rapidly. The rate at which you lower the targets does not matter greatly, but your raid should aim to stop DPS on Shannox around 35% health, and prepare to finish off both pets. They should die as close together as possible. Once they are dead, Shannox will become enraged and attack much faster and harder. Once both Rageface and Riplimb have been killed, your entire raid should focus their attention and DPS on Shannox. He will be doing 60% more damage and attacking 60% faster. This is where tank and healer cooldowns should be used and Bloodlust, Heroism or Time Warp are best placed. This final phase has a soft enrage timer, as each Magma Rapture will deal Fire damage to the raid and greatly increase Fire damage taken. He casts this ability once every 15 seconds, and your raid will be able to survive around 4 or 5 of these before getting one-shot. The fiery explosions caused by Magma Rapture should be avoided by everyone. During this phase, Shannox will continue to place traps, which should be avoided now more than ever. Magma Rapture damage can be mitigated through use of abilities, such as Devotion Aura, and certain classes can get rid of the Fire damage increasing debuff through abilities such as Divine Shield and Ice Block or Cloak of Shadows. It is especially important to pay attention to tank health when a Magma Rapture is about to be cast, as the damage from it coupled with Jagged Tear ticks and boss melee attacks can result in huge bursts of damage. The achievement Bucket List is part of the Glory of the Firelands Raider meta-achievement and is a requirement for obtaining the Corrupted Egg of Millagazor mount. The achievement itself is rather simple. It requires your raid to kite Shannox through the following locations before finally killing him: Path of Corruption, Beth'tilac's Lair, Flamebreach, The Ridge of Ancient Flame and Shatterstone. In order to successfully complete the achievement, you must kite Shannox through these locations in a single attempt, and defeat him at the end of it. Credit for the achievement is reset each time a new attempt starts. We advise your raid to pull Shannox at the Path of Corruption. He only needs to be kited up the path a very small distance before this part is completed. After that, by kiting him close to the rocky walls which enclose Beth'tilac's Lair, it is possible to get the credit for this part without having to go out of your way. The Flamebreach is essentially the entrance to the raid instance, and you should get credit for this anywhere at the bottom of the slope. Finally, The Ridge of Ancient Flame and Shatterstone are close to each other, near the bottom of the slope which leads up to Lord Rhyolith. In order to avoid Shannox' enrage timer, your raid will need to DPS the boss (and his pets) along the way, so that you can finish him off shortly after reaching Shatterstone. While doing so, it is imperative to keep in mind the Separation Anxiety buff, which the boss and his pets gain if they are too far apart from each other (more than 60 yards). Shannox' heroic mode version presents the most accessible challenge for raids attempting heroic Firelands. This section contains all you need to know to make the transition from normal to heroic Shannox. A mention must be made here, which is important to your raid's preparation for the encounter. For reasons detailed below, you will want to have as large a combat area as possible in which to engage Shannox (without the danger of aggroing trash mobs), so it is advised that you clear as much of the trash on the left of the Flamebreach as possible (on both sides of the road), all the way to the entrance to Beth'tilac's area. Neither Riplimb nor Rageface can be killed. Riplimb comes back to life with full health, 30 seconds after dying, while Rageface has an enormous health pool. Frenzied Devotion, the enrage that Riplimb and Rageface gain when Shannox reaches 30% health in normal mode, is not present in heroic mode. The dogs never enrage. Both Riplimb and Rageface gain a stacking buff, Feeding Frenzy, each time they perform a successful attack. Feeding Frenzy increases their damage done by 5% per stack and lasts 20 seconds. Shannox no longer casts Magma Rapture (as he only does that when Riplimb is dead, and Riplimb does not die). Overall, ironically, these changes make the fight easier (though slightly different) in its execution, and remove the soft enrage mechanics of the last phase, making the encounter truly the same from start to finish. We will cover the adequate strategy for the encounter in the section below. In addition to these changes, there are a few other, less important changes. Namely, Immolation Traps deal significantly more damage. Also, Shannox and both of his pets melee for more as well. Healers will simply have to be prepared to put out more healing than in normal mode, which is to be expected. Whereas in the normal mode version, trapping Rageface in Crystal Prison Traps was entirely optional, and trapping Riplimb was very useful, in heroic mode, it is mandatory that both pets be trapped regularly. The chief motivation for this is resetting their stacks of Feeding Frenzy, which can only be done by preventing them from meleeing anyone for 20 seconds. Obviously, in the case of Riplimb, it also serves the purpose of resetting Jagged Tear stacks on the tanks. There are other small adjustments to be made to your strategy, which we will explain below, but to sum up, this is the key difference. In both 10 and 25-man difficulty, you will want to utilise 2 tanks and have one tank on Shannox and the other on Riplimb. Feeding Frenzy, as noted above, is a stacking buff which both Rageface and Riplimb gain each time they successfully melee a player. Each stack increases their damage done by 5%, and the buff lasts 20 seconds. Parried, dodged or missed attacks do not apply stacks of Feeding Frenzy, and quite importantly, Rageface does not gain stacks of Feeding Frenzy while he is performing Face Rage. Face Rage is broken in the same way as in normal mode, by performing an attack of over 30,000 damage in 10-man difficulty and 45,000 damage in 25-man difficulty. This is made easy by the fact that all attacks made on Rageface during Face Rage are critical strikes. It is important to note that Rageface will focus on the player who broke his Face Rage, and attack that player for some time. Lastly, it is important to note that Riplimb is immune to traps while running back to Shannox with his spear (after a Hurl Spear cast), so any trapping of him to delay a him returning Shannox' spear must be done when Riplimb runs to the Hurl Spear location. Successful completion of the encounter will require your raid to regularly trap both Rageface and Riplimb, in order to reset their stacks of Feeding Frenzy (and in the case of Riplimb, the stacks of Jagged Tear as well). Trapping Riplimb is the exclusive task of the Riplimb tank. As in normal mode, Riplimb should be trapped when a Hurl Spear occurs, in order to delay his return to Shannox. Because Riplimb is immune to traps while he is carrying the spear, the tank should move Riplimb onto a Crystal Prison Trap before he has a chance to pick up Shannox' spear. The time it takes Riplimb to break out of the trap, grab the spear and return it to Shannox should be sufficient to reset his stacks of Feeding Frenzy as well as Jagged Tear stacks on both tanks. Trapping Rageface is a task in which the entire raid (minus the tanks) will have to participate. One ranged DPS (preferably an Arcane Mage) should be assigned to DPSing Rageface at all times. This will ensure that Face Rage is broken promptly. Additionally, a backup player (either another Arcane Mage or a Marksmanship Hunter) will need to be assigned. This backup player will DPS Shannox, but will quickly switch to Rageface to break Face Rage if the player assigned to breaking Face Rage normally is the one targeted. Because Rageface attacks targets at random and cannot be tanked, the entire raid (though chiefly the player assigned to Rageface) is responsible for ensuring that Rageface does not trigger Immolation Traps (to avoid gaining the Wary buff) and that he triggers Crystal Prison Traps when needed. The timing for trapping the dogs is one of the more delicate aspects of the fight. Your raid will have to alternate which of Riplimb and Rageface they trap at which time, as there are not enough Crystal Prison Traps to have both dogs trapped freely. Essentially, you will want to trap the two dogs in an alternating fashion. However, if Rageface's stacks of Feeding Frenzy are low (under 15) for whatever reason (running excessive distances, attacking a Hunter who has Deterrence active, etc. ), your raid can opt to delay trapping him. Riplimb should, however, be trapped regularly, regardless of his Feeding Frenzy stacks. The heroic mode of this encounter actually simplifies the fight, compared to normal mode. Your raid will no longer DPS Riplimb at all, as damaging him is totally useless. Rageface will also only take minimal damage, and the bulk of your DPS will be focused on Shannox himself. Raiders will still have to avoid Immolation Trap as well as the impact zone and subsequent explosions from Hurl Spear. Finally, your entire raid should attempt to get as much distance as possible from the Crystal Prison Trap in which Rageface is encased, so that when he breaks out, he will have to run a great distance to his first (random) target, allowing for Feeding Frenzy to wear out. The Shannox encounter becomes much easier in terms of execution once Rageface and Riplimb have been killed. Because of this, you should focus your learning efforts on the first part of the encounter. We advise you to initially ignore DPSing the boss and his adds evenly, but to instead focus on properly avoiding Hurl Spear and the boss' traps. DPS should be ignored altogether until a comfortable understanding of trap and dog mechanics has been achieved. This will enable you to perform much more smoothly when you do decide to start going for a kill. When learning the fight in heroic mode, the focus should be on correct trapping of the dogs. DPSing the boss is a secondary priority, and all DPS players and healers have to perfect trapping of Rageface when needed, as well as avoiding accidental triggering of the Wary buff. This concludes the Shannox strategy guide. Despite the fight appearing rather complicated, through proper use of DPS distribution, and ensuring that no target dies before its designated time, the encounter will prove to be very accessible.